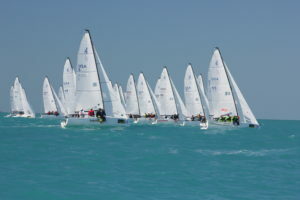 Since the launch of the J/70 in 2012, the class has grown every year. Growing not only in the United States but around the world. Just this past September 161 boats participated in the J/70 World Championship held by Yacht Club Costa Smeralda in Sardinia, Italy. 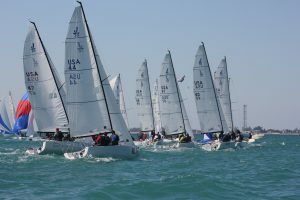 The US represented well at this World Event, Peter Duncan of American Yacht Club took home the win, and Brian Keane of Beverly Yacht Club placed second. This high-performance one-design class is taking off in the US as an exciting boat to sail and is attracting sailors of all ages and abilities. 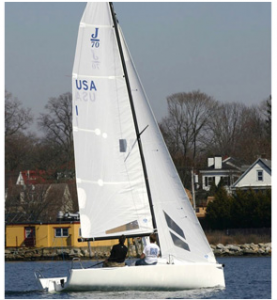 The J/70 was designed to help to fill a need for a boat that is easy to own, easy to tow and launch, and easy to sail. This 22.75 foot boat is the first J/Boat that is a ramp launch-able keelboat. 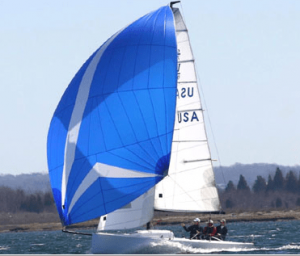 The J/70 is replacing old keelboat fleets across the world in sailing clubs. By replacing these older fleets, the J/70 is attracting younger sailors to join the class. Top sailors have been enjoying this boat and helping to grow the fleet and competition. With a long cockpit and moderate boom height, the boat is comfortable and easy for crew movement across the boat. This boat is great for competition, but its stability also makes it great for kids to seniors. Competitive edge, but easy to sail for kids to seniors.